Merlin Rosser, our Heritage Sites Manager, was recently given the opportunity to visit a 100 year old catholic church at the Kehewin Cree Nation, located near Bonnyville, Alberta. 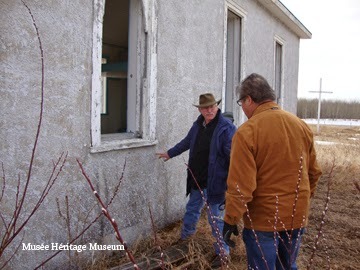 This opportunity came about when Harvey Young Chief, Indian Residential School Coordinator, saw the St. Albert Gazette article about Merlin's restoration project of the Chevigny house in St. Albert: Restoring layers of history. Harvey then contacted Merlin and asked if he would like to come look at the old church in Kehewin. Merlin, one who could never turn down an opportunity to examine historic buildings, jumped at the chance. I was also invited by Merlin to take the two and a half hour trip to Kehewin to tour the place. As the archivist, I thought this would be a great opportunity to learn more about the history of the church and the significance it played for the area. 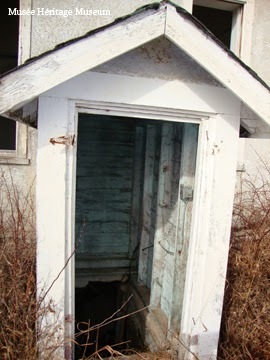 The old church was built in 1914 and has not been in service in over the last 10 years. 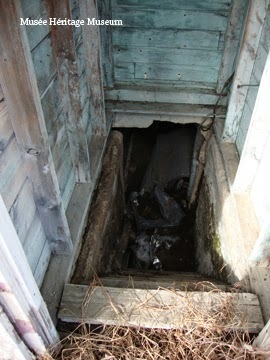 So when Merlin and I arrived at the base of the church, we expected to find a building in rough condition. However, to our pleasant surprise, the building was in relatively good shape. Harvey met up with us and took us inside the church, allowed us to have a look around and take pictures. The place was certainly showing signs of wear and tear over the years, but Merlin in particular was thrilled to note that the building structure was in good shape, especially given its age. We took a tour around the church to examine it and then went down into the foundation area as well, which was neat for me. 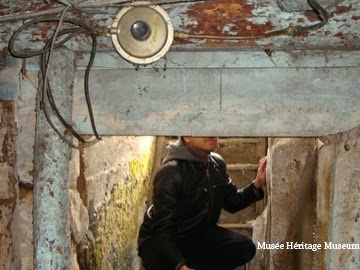 I actually kind of felt like an archeologist, a la Indiana Jones, with my big flash light and camera in tow. Vino perched up on the stairs as Merlin takes a photo of the foundation entrance from beneath. After examining the foundation area, Harvey, Merlin, and I then had a nice chat about the history of the church, about the different documents, artifacts, and photos related to the church, and the land surrounding it. Harvey told us some neat stories of the area, such as Bishop Grandin of the Archdiocese of St. Albert coming down to bless the area in the late 1800s. 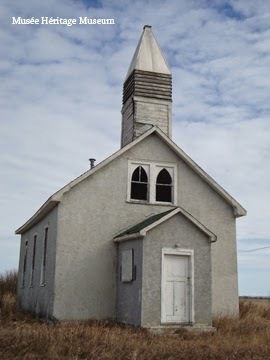 It was also interesting to note that the church attracted people from a large region in the St. Paul, Alberta area. The church grounds is the site of the annual St. Joseph's pilgrimage, which dates back to the mid 1940s. The pilgrimage attracts people from across many nations, where the pilgrims converge up at the shrine on St. Joseph's Hill, which is just behind the old church. 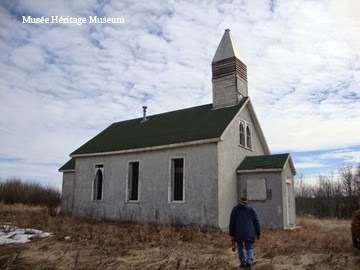 Both Merlin and I were honoured that Harvey contacted us to come look at Kehewin's old catholic church. As Musée employees, it really is a cool aspect of our jobs to be able to assist with the development of historic resources in our extended community. how is it possible to know more about this pilgrimage? Beginning, history? Hi. If you visit the Kehewin Cree Nation website here: http://kehewincreenation.ca/index.php?option=com_content&view=article&id=90&Itemid=88, you'll notice that they talk a little about the pilgrimage. There should be contact info on their website if you are interested in knowing more about the pilgrimage.